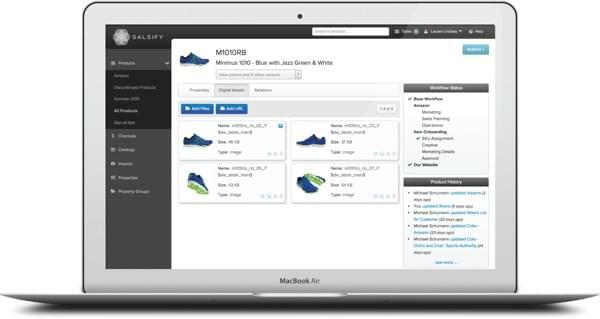 Salsify, based in Boston, Mass., is a cloud-based sales analytics and product information management system designed especially for suppliers and retailers in the ecommerce industry. Salsify was co-founded in 2012 by ecommerce and analytics experts Jason Purcell, Jeeremy Redburn, and Rob Gonzalez. Salsify, according to its website, was started “to make creating, managing, and exchanging great product information — especially rich marketing copy and extended attributes — easy, efficient, and even fun.” Salsify’s platform was born out of necessity. While employed at Endeca, a BI vendor, Purcell and Redburn helped deploy ecommerce analytics for top online retailers like Target and the Home Depot. During these implementations, Purcell and Redburn experienced the all-too-common pain associated with product-related content. Ecommerce retailers frequently have specific requirements for the content on product listing pages — some want 2000 character descriptions, others want 4000. Coordinating information across hundreds of suppliers and thousands of products — and matching them with retailers’ requirements — is what Salsify was built to do. Properly leveraging the scalable product information software solution provided by Salsify can help suppliers get their products to market faster and maximize sales opportunities. It helps retailers by providing a central, consistent message for each product listing, and allows smaller teams to work more efficiently. There are no limits to the amount of users, channels, storage, or workflow management tools with Salsify. Contact us for more information and to get access to a 30-day free trial. If you’re an ecommerce retailer or supplier, Salsify can likely help your business. If you’d like to learn more about Salsify or other business software systems, check out our Marketing Software Product Selection Tool, or if you’d prefer, call, click, or email to speak with an unbiased Technology Advisor for a no-cost, no-obligation consultation on your unique requirements. Learn everything you need to know about Salsify. Our experts will reach out to you shortly.